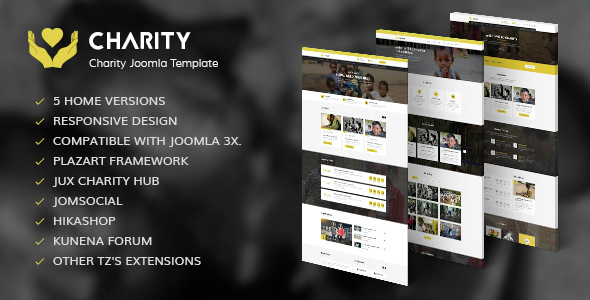 Charity template is a clean, modern but user friendly Joomla template which is typically created for agencies with 05 elegant home versions and some popular pages such as blogs, portfolio, cause, event, hikashop, forum, contact and about us.. Owning a range of cutting-edge and out-standing features, this template surely makes your website amazing, attractive and impressive. It is a responsive Joomla template and built on Plazart Framework and strongly supports Joomla! 3.x with HTML5 and CSS3. Accompanying with making use of Plazart Framework, Charity has a strong support for TZ Portfolio Plus, TZ Multi Purposes, Unit Revolution Slider 2, JComments and other TemPlaza’s extensions. We are sure that Charity will help you to create an awesome website. Fix error page Home 3 doesn't display. Fix error page "One Page" doesn't display. Fix error can't display tweets of module TZ Twitter Widget. Fix error create new topic of forum. Fix error in back-end of modules: TZ Social Custom, TZ Skills, TZ Services, TZ Pricing Table, TZ Testimonial. Fix error of profile's form in front-end. Add options in plugin "System - TZ Charity Params": Show Social, Show Related Article for Blog and Article views of com_content. Add option Open in new tab for link in module TZ Services. Fix error countdown of events. Remove addon Image Carousel in quickstart(Move carousel's options of this addon to plugin System - TZ Charity Params). Fix error avatar hover of JomSocial. Fix error modal lightbox of Kunena. Add module TZ Social Custom to package. Fix error countdown of events for view article and portfolio. Added: Google Map API Key. Insert option "Show Events's Countdown" for module TZ Portfolio Plus from plugin System - TZ Charity Params. When being our member, you have access to our forum where you can post your problem and get support to solve it. It includes two supporting systems: the Ticket system, by submitting a ticket about your problem to us, member will receive answer to the problem. It is also fast and easy to check whether your problem has been solved and how it is fixed. The second worth-mentioning supporting system is FAQ includes a lot of useful information to be found. It is also possible to e-mail to support@templaza.com in order to ask them for help.